The other day, Anne Wareham asked on Twitter "Would twitter survive a ban on the word 'lovely'?". My response was: Noooooooooooooo. Lovely is used to describe a lot of gardens. At lot of the time. And I believe Anne feels it is used rather too much and that it has become ubiquitous with nice. Something you say when you haven't bothered to either give it more thought or because you don't want to offend anyone. You say: you have a lovely (nice) garden. You think: that was a boring garden. I hold up my hands to the fact I do use the word lovely a lot. Hence my Noooooooooooooo in response to Anne's question. To me it conveys a sense of warmth and gentle pleasure. But I do see that it can be a by-word for nice and that I could be a bit more creative with my descriptions of the gardens I visit. A few years ago I worked as Assistant Editor for Gender & Development Journal. This included both editing submissions and researching and writing articles myself. At this time, my best friend was my Thesaurus and I always had it just near my keyboard. I was forever using it to try and expand the ways in which something might be expressed, often finding a better word that the initial one I wrote. It made for better writing and was fun too; sometimes I would go off on tangents exploring words and getting ideas for more creative ways of conveying meaning within a sentence. 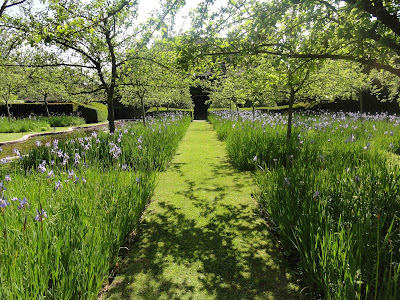 From each of these words you can go off on tangents to find other related and perhaps more suitable words to convey the word lovely when describing a garden. Sadly pulchritudinous* doesn't have it's own entry in my thesaurus. *Look out for this word appearing in a post**, but don't ask me to pronounce it! **That is, if I visit a garden that can indeed be described as pulchritudinous. & - requiring careful consideration:a nice point. But what I like best about you taking me slightly (!) seriously is that describing a garden without 'lovely' will require more reflection and attempt at accuracy? Can't be bad. What a smashing list of words!